HDOT recognizes the need for safe, comfortable, and convenient travel alternatives that enhance the mobility of Hawaii’s residents and visitors. This page provides a gateway to information on bicycling and walking in our state. Explore the following resources and learn more, from pedestrian safety tips, to the updated Bike Plan Hawaii! 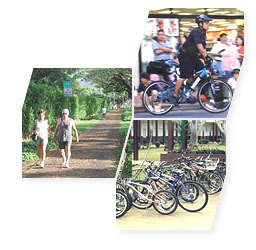 Bike Plan Hawaii 2003 is a state Department of Transportation master plan to create a guide for enhancing the bicycling environment through a variety of channels – from grassroots initiatives to government actions. The plan recognizes that bicycle facilities have become integral to our state and city transportation infrastructure. External hyperlinks are provided for informational purpose and for the benefit and convenience of the general public. The Hawaii Department of Transportation does not testify to, sponsor, or endorse the accuracy of information provided on externally linked pages.